In honor of our upcoming production of She Loves Me on stage Nov. 6th-18th, we’re collecting stories from couples whose relationships began in the hallowed halls of Vasey, on stage, in the classroom, or behind-the-scenes. We’ve got plenty of love stories in our archives, and we’re spotlighting just a few in a series we’re calling Vasey Valentines. 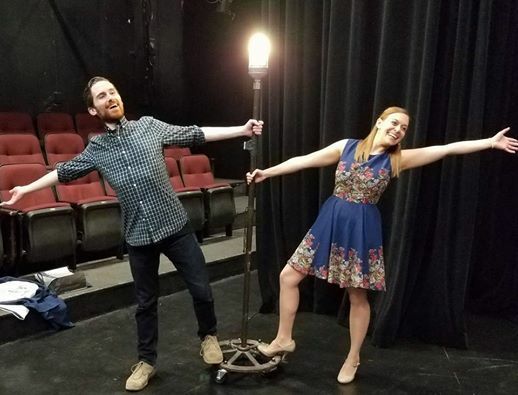 Below, hear from alumni Chris Monaco and Laura Barron (both ’17), two lovebirds whose magical romance is inspired by their shared love of Harry Potter. Love lights up our lives. Chris & Laura hamming it up by the ghost light in the theatre. How did you meet? Well – to be honest, we have conflicting stories about how we met. Laura SWEARS we met at auditions for Eurydice, back before classes had even started. But I have no memory of this (perhaps I was too nervous about auditioning for James Ijames!!!). I do remember callbacks, though. We were both sitting in the hallway, awaiting our doom, and a friend of mine said something about Harry Potter. I lit up, and so did she. We began to geek out together, and spent the rest of the night talking. What was your first impression of one another? Chris: I’m a sucker for big blue eyes and Harry Potter is, of course, my Kryptonite, so I thought she was the full package. I was immediately smitten. I thought she was intelligent, sweet, funny, and (once we began Acting classes), very talented. Laura: I remember thinking, wait a minute I didn’t meet this guy at Open House–when I was scouting out “husband material”, but he seems like a really cool guy. I am also a sucker for blue eyes, so I was drawn in not only by that but by our mutual love of all things “nerdy”. Would you ever work together? If you have/do, what is that like? We’ve acted together quite a bit (in and out of Nova) and have always had a great time of it. We’ve been lucky to play opposite one another a whole lot (A Wonderful Noise was our first time – and Harriet Power was so proud to think she’d created a “showmance”, only to have her bubble burst when she was told we’d already been dating for three months). 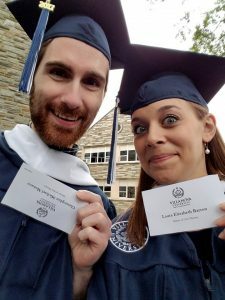 We’ve technically ‘worked together’ at WolfPAC post-graduation – but we’ve never taught in the same classroom! I direct and she choreographs, so it’s bound to happen at some point! What is something you love to do together? The cute couple in their cap & gown. What is your favorite Vasey memory? Well, I mean – we met in Vasey Hall, right outside the studio! We have so many memories tied to the space – from classes, to rehearsals, to work (we worked across the hall from one another – I was in the Art Studio working for Sister Helen while Laura worked in the costume shop for Janus). We were so lucky to get to sing together on that stage, and now we get to make new memories coming back and sitting in the audience for the newest season of shows. It really feels like it was serendipity – the fact that we both entered the program with no knowledge of one another, both at this perfect time in our lives to intersect. Villanova brought us together, and we’ll forever be grateful for that.